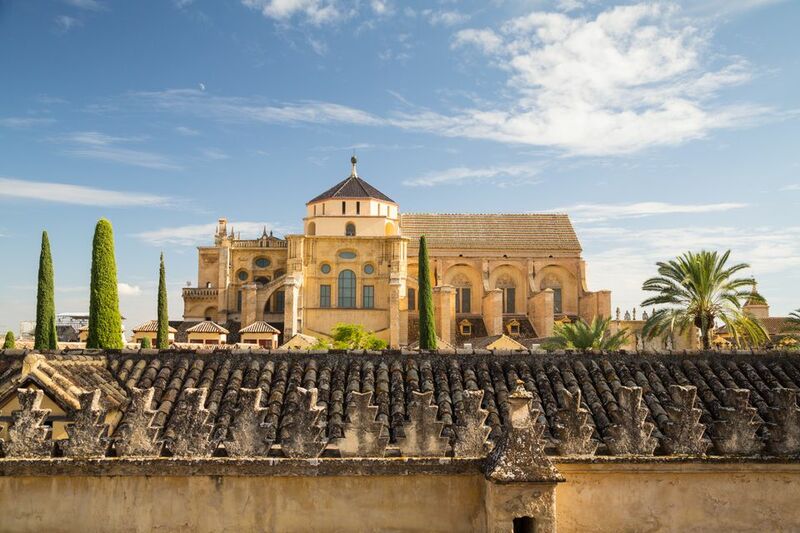 Its tower rises above the whitewashed buildings of the old Jewish quarter, and it’s earned a rightful place at the top of every list of Cordoba must-dos. The building in question: the one and only Mezquita, or mosque. With over a millennium of dramatic history behind it, the stunning monument draws millions of visitors every year and boasts accolades such as its status as one of Cordoba’s four UNESCO World Heritage Sites. The mosque dates back to Spain’s Muslim days — more specifically, 785 A.D., when Abderraman I built the first 110 of the iconic columns, which at one point grew in number to nearly 1,300 (about 850 remain standing today). Suffice it to say that the early mosque, while beautiful, was rather on the small side—at least compared to the grandiose, glorious structure that now draws scores of visitors every day. With time, however, the Mezquita grew larger and larger as Cordoba itself became one of the most important cities in western Europe. One important addition — the minaret, or bell tower — helped cement its status as the most important mosque in what is today Spain. In fact, the mosque was so awe-inspiring that even the enemies of the ruling Muslims couldn’t bear to destroy it. When the Christian Reconquest swept through Cordoba in 1236, the new rulers didn’t destroy the mosque and build their cathedral on top of it, as they’d done in other parts of Muslim Spain. Instead, they simply consecrated the existing mosque as a cathedral, and built their own jaw-droppingly beautiful church inside it over the course of the next few centuries. Individual tickets for the Mezquita-Catedral (“Mosque-Cathedral,” as it’s officially known today) can only be purchased onsite. Each adult ticket will set you back €10 and are sold at the ticket booth in the large courtyard outside the monument. Keep in mind that access to the bell tower (more on that in a bit) is separate from admission to the Mezquita itself and costs an extra €2 for adults. If you’re interested in taking a guided tour, you can find tickets available online in advance. Prices vary depending on the tour operator. Opening hours vary by day and by season, so be sure to plan your visit accordingly. November-February (Monday-Saturday): 8:30 a.m-6 p.m.
November-February (Sunday and religious holidays): 8:30-11:30 a.m. and 3-6 p.m.
March-October (Monday-Saturday): 10 a.m.-7 p.m.
March-October (Sundays and religious holidays): 8:30-11:30 a.m. and 3-7 p.m. The first part of the Mezquita you experience will be the "Patio de los Naranjos," an expansive courtyard filled with dozens of Andalusia’s emblematic orange trees. Be sure to take some time to enjoy the picturesque and peaceful atmosphere here before making your way into the mosque. Once you’ve stepped into the Mezquita itself, you’ll be struck breathless by the rows upon rows of candy-cane-striped arches supported by columns that have withstood centuries. You’ll feel as if you’ve stepped back in time to the glory days of Muslim Spain as you take in the stunning construction and beautiful details, such as the intricate carvings on the wall and ornate gold touches. However, it won’t take long before you start to notice the Christian influence on this unique building. Lining the perimeter are dozens of chapels paying homage to different Catholic saints and other important religious figures. And of course, the main chapel of the cathedral itself sits in the center of the building, a fascinating example of Renaissance Christian architecture in the middle of the forest of columns that make up Europe’s most famous mosque. Despite the scores of people inside the Mezquita at any given time, the place is remarkably serene, and large enough that you can often find a quiet corner to marvel at its beauty far from the chatter of other visitors. If you’re not afraid of heights and are physically able to climb the equivalent of 12 flights of stairs, you can’t miss the opportunity to trek to the top of the bell tower. Built on the site of the original minaret, the 177-foot-tall (54 meters) tower offers breathtaking views of the Mezquita itself and the historic center of Cordoba. Remember that tickets are sold separately from general admission to the Mezquita, and places are limited due to the small amount of space at the top of the tower. Now that you’ve seen the Mezquita, don’t leave Cordoba without checking out some of the other incredible attractions nearby. Cordoba’s city center is quite compact, making it incredibly easy to explore on foot. The second most important sight in the historic center is just a short walk away from the Mezquita. If the mosque itself stands as a testament to southern Spain’s Muslim heritage, the Alcázar de los Reyes Cristianos (Fortress of the Christian Monarchs) is a fascinating relic from the period of the Catholic takeover. The building has a bit of a brutal history. At one point, it served as the headquarters of the Spanish Inquisition, and Christopher Columbus met with King Ferdinand and Queen Isabella there before his voyage to the New World. Today, however, it is home to peaceful and colorful gardens, as well as towers offering panoramic views of Cordoba. If you’d rather see where Cordoba’s winding streets take you, don’t miss the chance to explore the picturesque juderia (old Jewish quarter) nearby, full of breathtaking sights and photo ops around every turn, like the postcard-worthy Calleja de las Flores. The view of the Mezquita tower peeking up from between the whitewashed walls lined with flower pots is one of Cordoba’s most iconic. And if you’re getting hungry after exploring, make your way down the street from the mosque to Plaza del Potro. Just a 10 minute walk away from the iconic monument, this lively and vibrant plaza is just out of the way enough that most tourists will never stumble upon it. Grab a table on one of the outdoor terraces spilling out of the myriad bars and restaurants on the plaza, and join the locals in enjoying some tapas and drinks.